I love teaching. I have been dedicated to the teaching profession since I joined Dr. Martin Luther King, Jr. Magnet School of Math, Science, Technology, and Invention as a first grade teacher in 1998. I teach my students to collaborate with one another, and across classroom, school, and state lines through our video lessons. Collaboration is not just something that I teach, but that I practice. My students and I owe our success in education to the collaboration with my wonderful colleagues and the many professional development opportunities my district has offered. As I encourage my students to be ‘always learning,’ I too am constantly looking for new growth opportunities and to learn with others. The Ocean Institute in California. Our work with videoconferencing has been nationally recognized, and is another form of collaboration. In 2007, Katie joined the Jessie T. Zoller Elementary School staff as an integrated 2nd grade teacher where an estimated 74% of students are eligibile for free/reduced lunch. She is still teaching at Zoller today. Her work with independent literacy centers has often been observed by teachers throughout her district and state. In May, 2010, Katie was awarded Teacher of the Year by the Schenectady City School District, which led to her applying for the New York State Teacher of the Year. 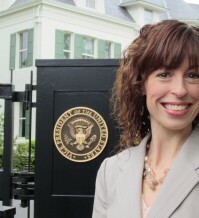 She was selected as New York State Teacher of the Year 2012. Katie’s class motto is “We work the whole time.” "Katie expects a lot from her kids, which is important in a district like ours," says Schenectady Federation of Teachers President Juliet Benaquisto. Ferguson believes that her mission is to make sure her students, no matter the challenges they face, have the foundation they need to achieve their fullest potential.